When Alexander the Great died in 323 B.C. he did not appoint a successor, leaving the vast Macedonian Empire without a sole ruler. As a result, his most trusted advisors and generals divided the army between themselves and began carving up the empire. Over the next few decades, they fought a number of wars against each other. Finally, after a half-century, three main successors emerged to rule: Antogonus, Ptolemy, and Seleucus. The Ptolemies based themselves in Egypt, the Antagonids held onto Macedon, and the wealthiest of the three, the Seleucids, controlled what is now Lebanon, Syria, and much of Southern Turkey. For the next 250 years the Seleucid Dynasty, which spanned from roughly 310 B.C. to 64 B.C, was truly a combination of Greek and Middle Eastern culture. Due to wars and instability, the Seleucid Empire began to erode around 164 B.C. and the last relevant king, Antiochus VII, ruled from 138-129 B.C. until he was killed in battle. 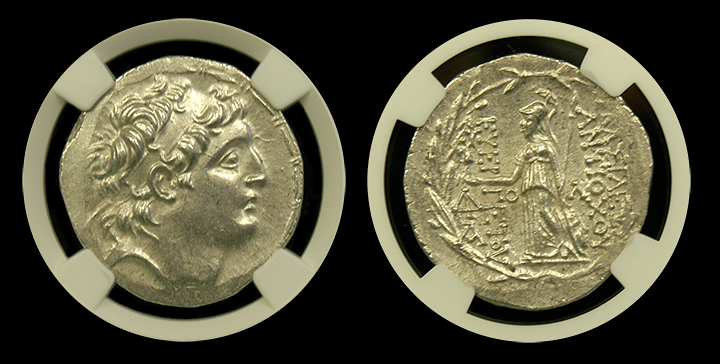 We just took delivery of a small group of absolutely beautiful silver tetradrachms struck by Antiochus VII. The front depicts a lifelike bust of Antiochus facing right and the reverse shows Athena, the goddess of wisdom facing left holding Nike, the goddess of victory. These large silver ancients are about the size of a silver dollar and are well-known for their high quality and beauty. Besides the obvious historical importance, each of these coins were hand-struck in a stunning high relief and because of this, no two coins are exactly alike. All orders will be shipped for free and we can offer a 3% discount if paying by check or wire. Each has been graded and authenticated by NGC Ancients. or feel free to order online. Questions? Just give us a call, we’re happy to help!